We design, make and test the glass molding aspheric lenses all in house: Creating the high precision molds, glass molding, aspheric surface measuring and testing and high quality AR-coating. Optowide owns the most advanced facility for molding glass aspheric lenses in this industry. We developed many unique molding technologies from mold protection and repair, multi-cavity molding, after-molding treatment etc. Reduce the manufacturing cost and make our products more competitive in the market. Optowide Aspheric lenses series is widely used for coupling light into and out of optical fiber, and collimating diode lasers. f is focal length, d is beam diameter at the focus, D is the 1/e2 diameter of the collimated beam and lambda is the wavelength. Focusing: be sure the NA of the focused beam is smaller than the NA of the fiber to maximize coupling efficiency. Collimating: be sure the NA of the lens is larger than that of your fiber or diode so that you are capturing all the available light. 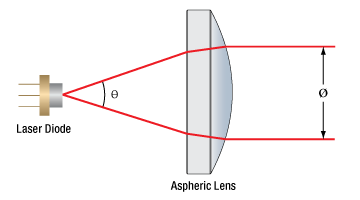 As the introduction, the aspheric lenses has many advantages in system, The incorporation of aspheric lenses in complex lens system can provide significant image quality improvement, reduction of the number of lens elements, smaller size, lower weight and actually reduce the overall system design cost. While comparing to the plastic aspheric lens, glass aspheric has better temperature and image quality where it has advantages. With our innovative glass molding technologies, we can produce molded glass aspheric lenses with good quality at much less price than the polishing aspheric lens while comparable to the plastic aspheric lens. So it is the time to replace your bulk spherical lens system with our aspheric lens, and select our glass aspheric lens when you have problems with the plastic aspheric lens! If you are interested about our products.Please check the products list as follow to get more detail, and you can contact our engineers for your demands.